Amy Gumm failed in her mission, but she’s not going to stop from trying to end Dorothy and return Oz to its former glory. However, with the Revolutionary Order of the Wicked scattered, Princess Ozma might just be the only ally she has. Moreover, for Amy, she realizes that there is more to her connection with Oz than she thought. 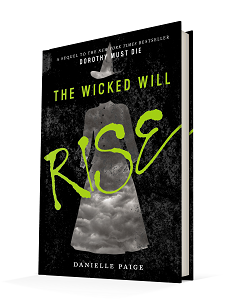 Published March 31, 2015, by HarperCollins The Wicked Will Rise is the second novel is Danielle Paige New York Times bestselling Dorothy Must Die young adult series that retells adventures in Oz with fantasy, magic, and mystery. Amy is supposed to be the unconventional hero, and Paige succeeds in doing that. There’s a touch of darkness in her, but it’s how she handles that darkness that makes her different than Dorothy. Her use of magic, the way she challenges the world around her allows her to remain a powerful protagonist. There is resentment inside her, anger and fear and it allows her to grow as a character through the plot. Oz continues to change alongside her, and there are many challenges that she faces regarding them. There’s so much character growth in the novel, and everything that makes Amy Gumm worth reading is everything that makes her unique. Amy is not the typical heroine. She has pink hair and is a bit of tomboy. Should that make her any less of a hero? No, but there are usually tropes that authors fall into not for any other fault of their own. People tend to write what they read, what inspires them. Paige takes it that extra step. Amy has had a hard life, and in Oz her life hasn’t gotten any easier. Being faced with countless dangers, her life on the line, it’s vastly different, and the way she adapts to it is what makes her as unique as the story being told. She’s a strong female protagonist, but she isn’t always strong, she’s scared, pissed, and lonely. Combined with the magic inside her, which is very dark, the inner turmoil her character goes through evolves her. A good novel is one that inspires an emotion from the reader and this one does that. It challenges free will more deeply than the previous one and highlights the struggles of being free from a personal prison. That’s adds depth to the story, allowing the reader to believe what’s going on in the story, to believe the characters. There are some heartbreaking moments in the story, and they will evoke powerful emotions in the reader, That’s excellent storytelling. Moreover, more of the characters get to shine in the novel; they get to come alive, giving the plot more tension to keep the reader hooked. [ Smiles ] This looks like a book that is worthy of being read.